The inhabitants of Kitava are one of the most medically studied primal societies today. Staffan Lindeberg and his team have published much of the research. Their investigation clearly shows that Kitavans are a real-life example of how a primal lifestyle contributes to overall health. Kitava is an island situated among the Trobriand Islands of Papua New Guinea. It is located about 3,300 miles southeast of Hong Kong and about 1,740 miles north of Sydney, Australia. There are approximately 2,300 residents living in Kitava as of 1990 statistics. Kitavans are farmers and fishermen. They live a lifestyle and eat the foods that are basically the same as their ancestors enjoyed for centuries. Kitavans have relatively no heart disease, no high blood pressure, no diabetes, no obesity, and no acne. In addition, they have relatively healthy mouths. They are strong and fit. 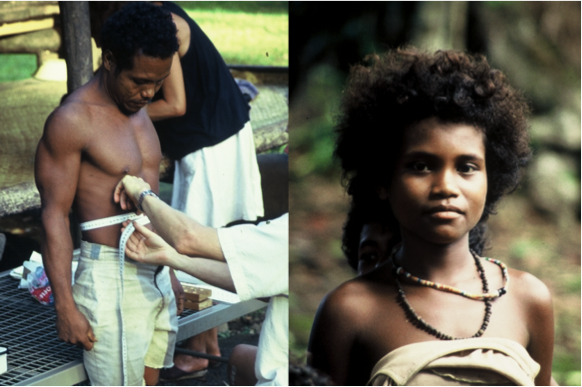 The people of Kitava are real-life examples of how a body responds to nutrient-dense, anti-inflammatory foods and an active lifestyle. In addition, they lead an uncomplicated life with little emotional stress and a healthy exposure to the sun. Surprisingly, about 75% of Kitavans occasionally smoke tobacco. Some may say these people are genetically gifted because of their resistance to chronic diseases. But, that may not be the case. When Kitavans have migrated to westernized societies and succumbed to processed foods and compromised lifestyles, their health suffered. There is another factor, which may have helped Kitavans resist chronic disease. This study, published in 2016, described how exposure to specific microorganisms early in life might have improved the immune system of Kitavans significantly. Kitavans have high numbers of an antibody, which is specific for a chemical related to certain bacteria and parasites. Other research has shown that the presence of this antibody is inversely related to cardiovascular disease and other chronic inflammatory diseases. In other words, the exposure to naturally occurring environmental pathogens in childhood may enhance the body’s immune system to prevent chronic inflammatory diseases in the future. Here is more detail about this “immunity.” I’ll get technical about this antibody for all those geeks out there like me. The article I referenced above speaks about phosphorylcholine (PC). This is a chemical that is extremely inflammatory and becomes exposed on surfaces of specific cells. Some cells on which PC is exposed are oxidized LDL particles, damaged and dead human cells, and some bacteria and parasites. Antibodies that the body creates to offset the harm of PC are very anti-inflammatory. Large numbers of these antibodies floating around in the circulatory system provide resistance to chronic inflammatory diseases. The science shows that humans exposed to low-grade infections from specific bacteria and parasites develop very high levels of PC antibodies against phosphorylcholine. Kitavans are not the only society who lives a life mostly unadulterated by westernized processed foods. Traditional Aché, traditional Inuit, and traditional Masai eat completely different diets than Kitavans. But, these primal societies are basically free of degenerative diseases and dental disease. Why is that? Is a high fat diet unhealthy? Is a high carbohydrate diet unhealthy? Are microorganisms in the natural environment unhealthy? The answers to these questions are, “No”. The truth lies in the environment. The truth is in the foods and elements that are endemic to a natural, untainted ecosystem. It is unhealthy to choose poor quality foods. Processed foods, food additives, GMO foods, chemically sprayed foods – all this tampering of our food supply is causing degenerative diseases, tooth decay, and gum disease. In addition, it is unhealthy to avoid naturally occurring microbes because of fear of infection. To enjoy health, longevity, and quality of life, embrace the basics of a nutrient-dense diet and primal lifestyle. Literally, get into the dirt and become exposed to natural microorganisms. But also, welcome the miracles of modern medicine to treat acute infections, broken bones, and life-threatening events. The best of a primal way of living and the best of a modern way of surviving are the best of both worlds.